Do yoga inversions reverse the flow of blood? Forcing yourself into lotus can be risky for your knees–especially for your meniscus. 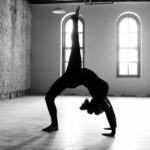 Learn how to come into the pose more safely in this video clip from a yoga anatomy workshop I taught recently at the Shala in New York City. Just put up another video from the yoga therapy workshop series on the knee that I’ve been teaching at the Shala. This one is on knee hyperextension in standing. I’ll be doing one more class on the knee, focusing on meniscus injuries, Tuesday, February 25, 1:35pm at the Shala, 815 Broadway, NYC. Just put up a video clip from my first knee workshop last Tuesday at the Shala, about preventing patellofemoral pain in Warrior II. If you missed last Tuesday, I’ll be doing two more workshops about the knee. This Tuesday, February 4, we’ll go over repetitive stress injuries and what happens when you hyperextend your knee….